This work by Cristian Chironi could have been titled Rew or Backwords. It is a journey backwards in time through the image that does not appeal to memory. Just sailing, inhabiting frames, possible reconstructions, mental projections. 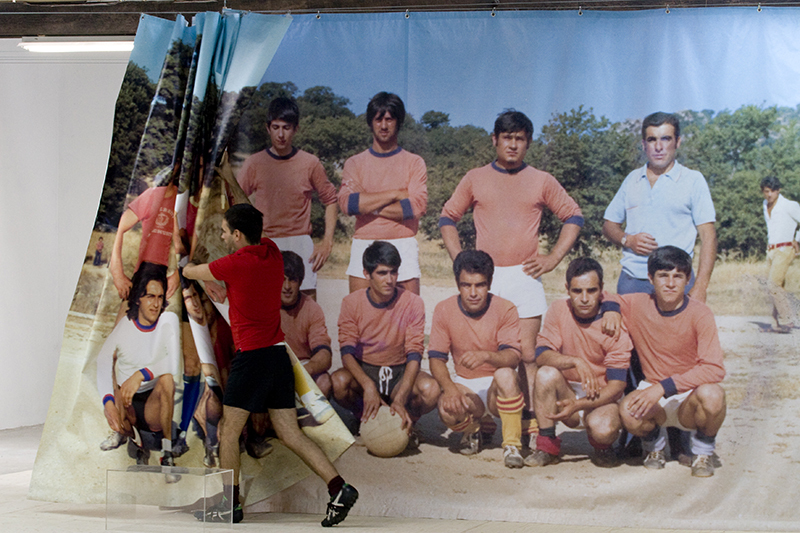 The concept is simple: a selection of 7 photographs portraying his father, a passionate football player in different sides (Oranese Calcio and others), posing with team and coach. Group photos belonging to different years, presumably 1980, 1978, 1971, 1968, 1962… full scale, where a living player sets in: Cristian Chironi. The tepid screeching of a three-dimensional element overlapping the flat image of a poster – although on a consistent scale – does not aim at deceiving. Poster is not a trompe l’oeil, it is a game of experiential crossing. A manic one perhaps? To a certain extent it is, because C.C. played thoroughly, recreating the sports clothes of each photograph and period and delving into the micro-variations of costume – and consequently into the cultural changes – of a small village of central Sardinia.